The black rhinoceros is one of the two species of rhinoceros found in Africa. The skin of the black rhinoceros is gray and not black as its common name may suggest. 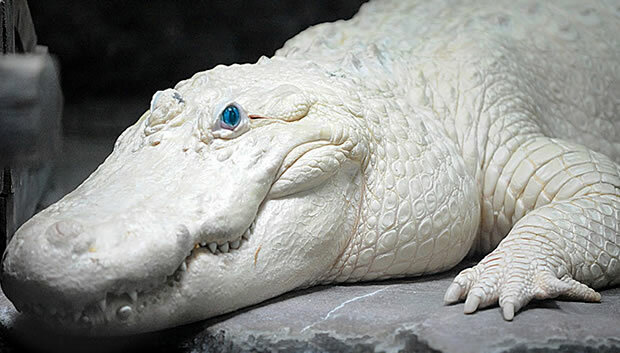 Its skin may sometimes appear black after its daily mud bath in black or brown marshy areas. The mud helps keep insects off and keeps the rhinos cool in the hot African climate. The black rhino can weigh from 2000 to 4000 lb, though it can move very quickly (up to 35 mph) when ready to charge, and can reach a body length of 9 to 12 feet. Rhinos have poor vision but a good sense of smell. Their sinus passages are said to be larger than their brains. Two horns appear on the black rhino's head, the front one being longer and measuring up to 53 inches in length. This species is known to be aggressive especially when detecting danger. The black rhinoceros eats mostly leaves, young shoots and twigs. Breeding occurs year-round, but most births occur during the rainy season. Males wonder alone until it is time to breed or when wallowing in waterholes with other rhinos. The female gives birth to only one calf after a gestation period of 15 to 18 months. The calf remains with the mother for up to three years. 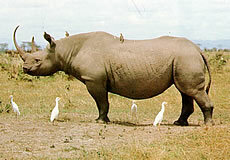 There are four subspecies of black rhinoceros: The South-central black rhinoceros (Diceros bicornis minor), the South-western black rhinoceros (Diceros bicornis bicornis), the East African black rhinoceros (Diceros bicornis michaeli), and the West African Black Rhinoceros (Diceros bicornis longipes). In the 1960s an estimated 70,000 black rhinos were found in Africa and in 1981 the numbers had dropped to around 15,000, and only twelve years later, slightly more than 2000 of the population remained. The main cause of decline is poaching and the demand for its horn. The horn is used for ornamental dagger handles and worth over $20,000 in the black market. It is also considered a symbol of wealth in many countries, and in Asia is it is considered a valuable source of medicine. This animal is protected under the CITES treaty and conservationists have tried removing the horns to discourage poaching, but poaching still seems to continue. Copyright Notice: This article is licensed under the GNU Free Documentation License. It uses material from the Wikipedia article "Black rhinoceros". Glenn, C. R. 2006. "Earth's Endangered Creatures - Black Rhinoceros Facts" (Online). Accessed 4/21/2019 at http://earthsendangered.com/profile.asp?sp=400&ID=1. Need more Black Rhinoceros facts?